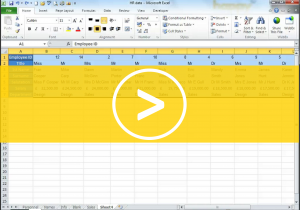 All of our Excel Videos are listed below. We have separated them into categories so that you can browse more easily. 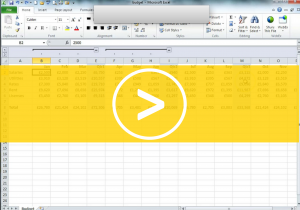 Set up spreadsheets quickly by getting Excel to fill in series of data for you. 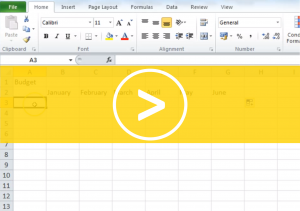 Make Autosum even faster with this nifty keyboard shortcut. 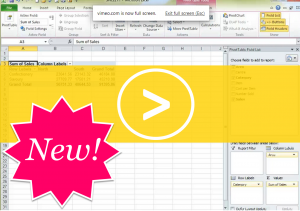 Get more flexibility from Autofill for faster fills the first time. 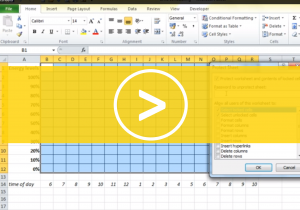 Top short-cuts for even better productivity in large spreadsheets. 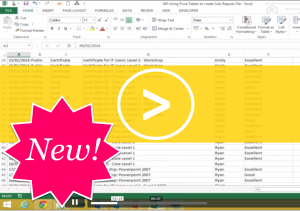 Speed up data entry and improve the quality of your data. 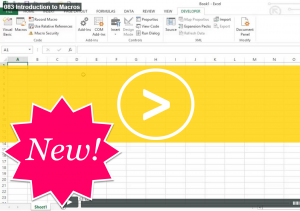 Macros can turn a whole series of steps into a one click action, this clip will show you how to use a macro to tidy up a spreadsheet that you regularly receive. 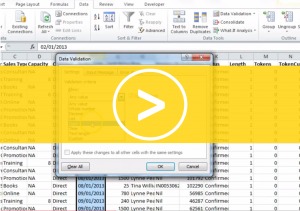 Get more functionality from your data by using the correct date formats. 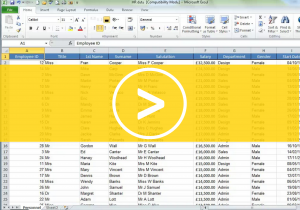 Identify duplicates in large sets of data from different sources. 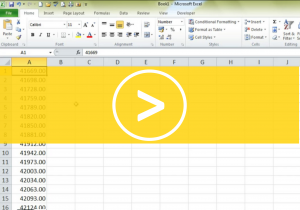 Avoid retyping information and have more control when you copy data into your worksheet. 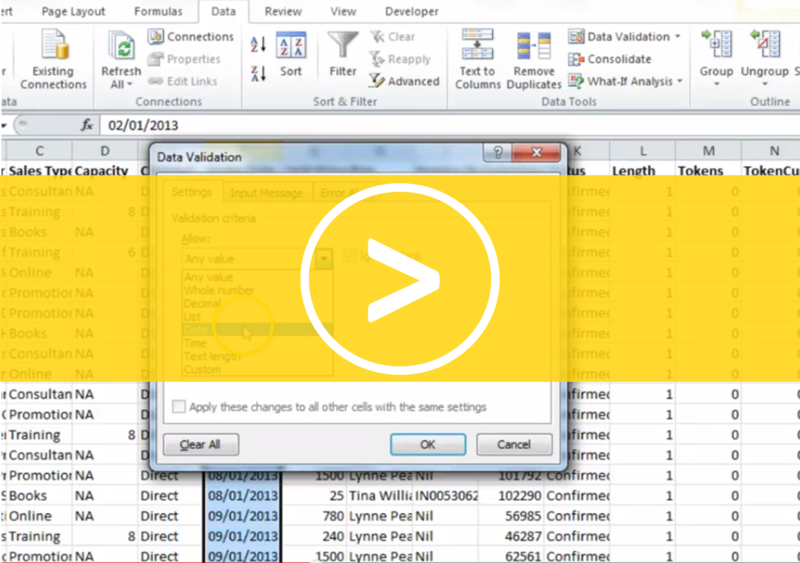 Quickly identify and fix invalid data so all your summaries and reports are accurate. 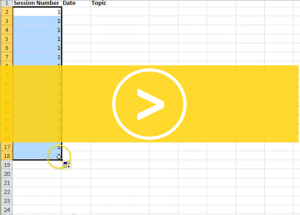 Find out how to keep your headings and labels in sight at all times, even in large spreadsheets. 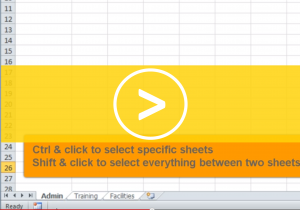 Group worksheets together so that actions you perform on one will appear on all sheets in the group. 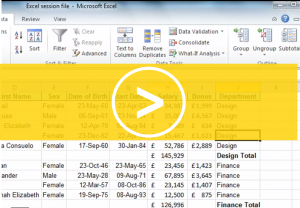 See two sheets from the same file side by side and get a better understanding of your data more quickly. Home in on just the information you are interested in with Excel filters. 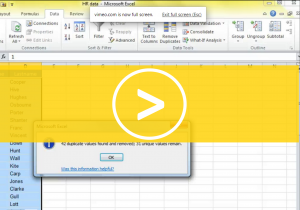 Filter away unwanted data and then preserve the information you need. 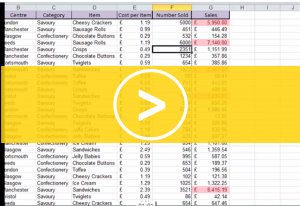 Sort your list on more than one column to give your data some structure. 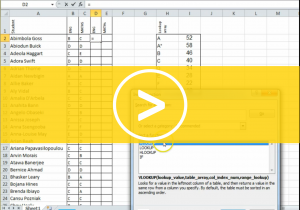 Did you know you can sort horizontally as well as vertically? 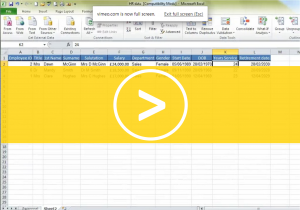 Watch the clip to find out how. 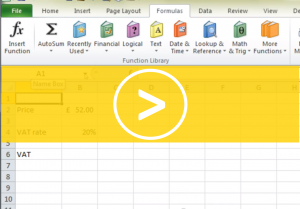 Use subtotals to turn a list into a summary table in a few clicks without the need for any formulas. 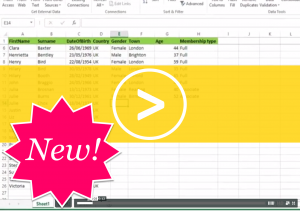 If you use Excel to store data and you haven’t converted it to a table you should really check this out. 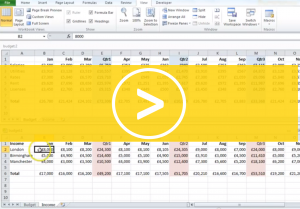 Improve your reporting by grouping dates in a pivot table into months, quarters or years. 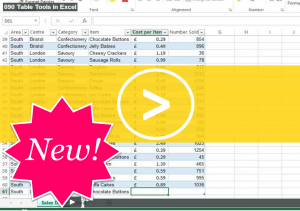 Splitting data up into departments, customers, or team members can be time consuming, we’ll show you how to use pivot tables and do it within a few clicks. 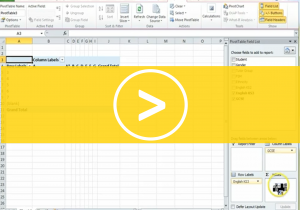 Summarise and analyze large data sets easily with pivot tables. 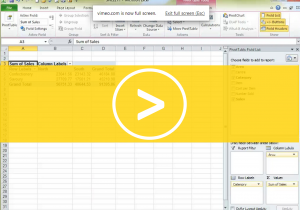 Make more sense of your data easily and quickly with pivot tables. 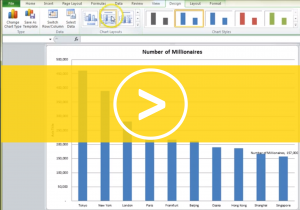 Make your point with great looking column charts. 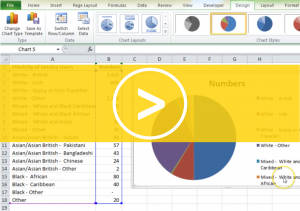 Use pie charts to help others quickly understand your data and the message you are trying to communicate. 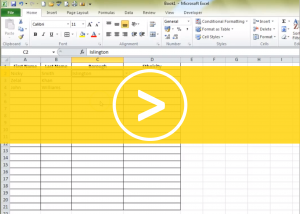 Protect worksheets so that data never gets deleted â€“ great for sheets you share with others. 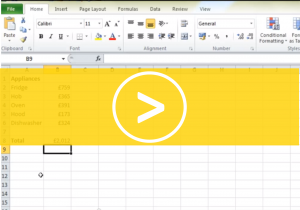 Improve your spreadsheets usability with range names. 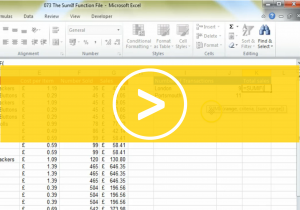 There are several different counting functions in Excel, learn how to pick the right one for the job! 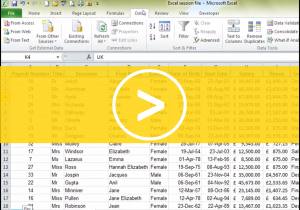 Count cells that contain data that meets certain criteria such as transaction in London. 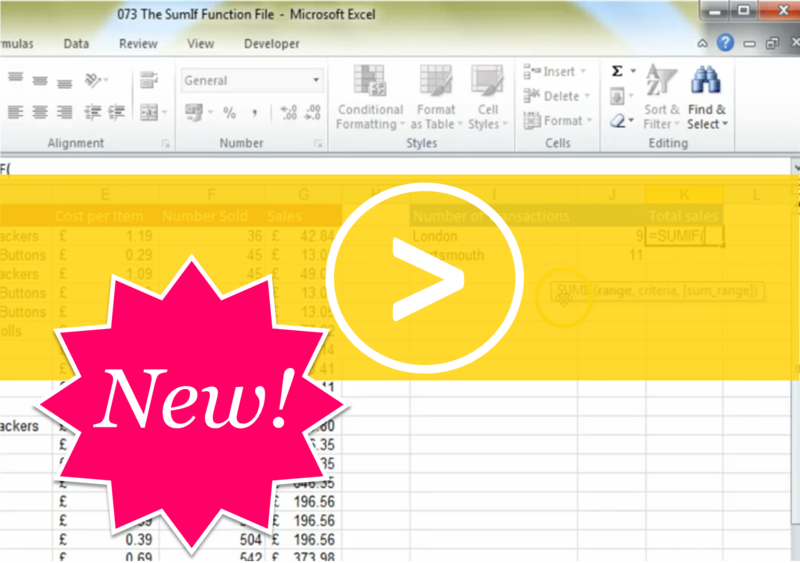 Total up an amount based on another criteria by typing in the SumIf Function for example total salaries for your department. 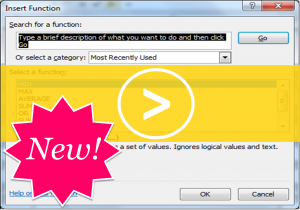 An If Function lets you set a rule and decide two different outcomes, im this clip we’ll show you a simple example to get you started. 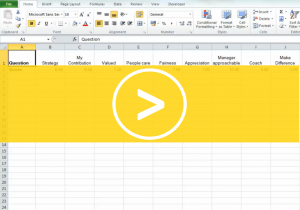 Make important data stand out filter out the rest in a few clicks. 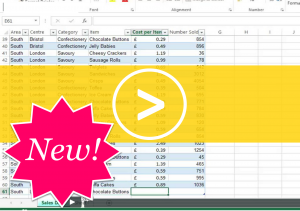 Conditional formatting changes the look of a cell depending on its value, now you’ll be able to set your own rules so it does just what you want. 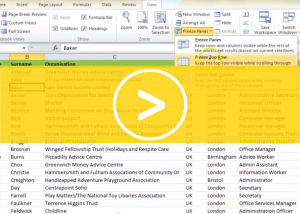 All the tricks you need to get your spreadsheets fitting onto the fewest numbers of pages. 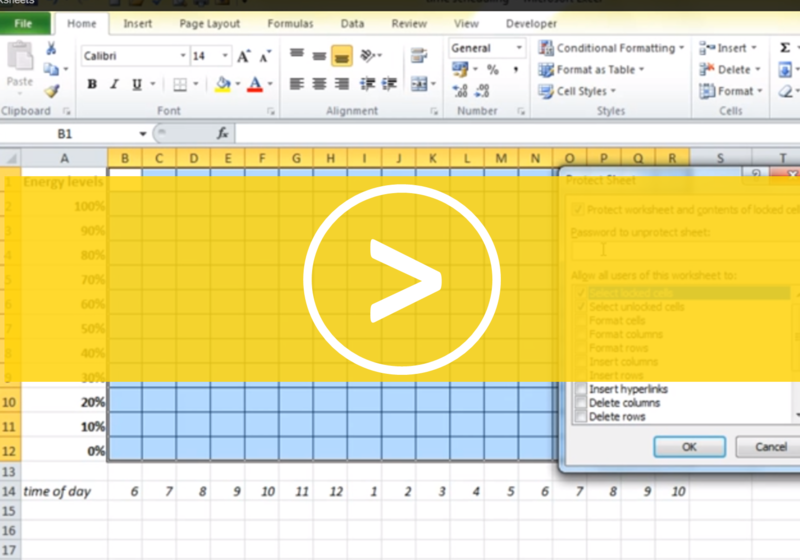 Print heading rows and columns to make reading a printed out worksheet easier. 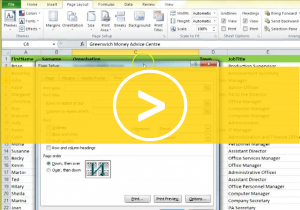 Macros are a way of automating repetitive tasks and saving yourself a boring job, this clip will show you the basics. 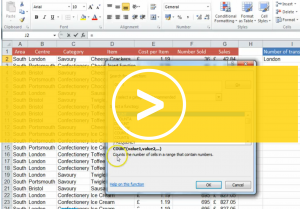 Macros can be used for all sorts of repetitive tasks, this macro will ensure any custom formats you use a just one click away on your quick access toolbar. 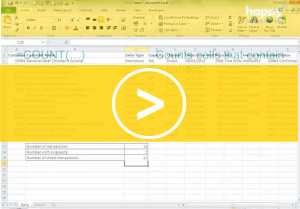 Calculate what percentage one number is of another and learn how to display the answer properly.